Russian Helicopters, a part of Rostec State Corporation, is negotiating the financial and technical details of the contract for the overhaul of the Mi-26 choppers with the Indian side, the official said. 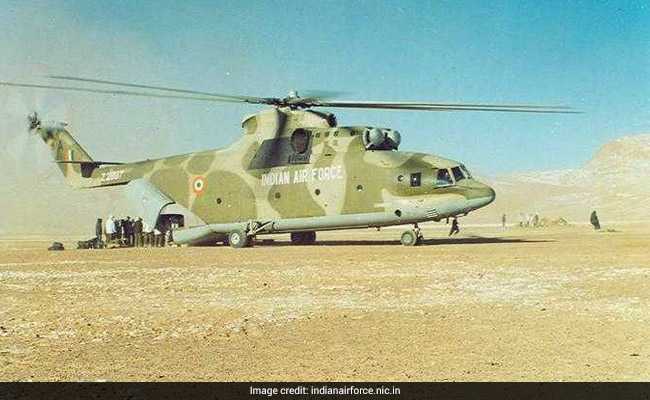 New Delhi: India and Russia are set to sign a contract soon for the overhaul of three Mi-26 helicopters for the Indian Air Force, with Moscow also offering long-term maintenance service for IAF's Mi-17 choppers, a Russian official has said. Russian Helicopters, a part of Rostec State Corporation, is negotiating the financial and technical details of the contract for these overhauls with the Indian side, the official said. In October, Russian Helicopters completed the repairs of five Mi-17 helicopters and will deliver these to India in the near future for flight tests and repair acceptance. According to a contract with Rosoboronexport, 30 units of Mi-17 helicopters will be repaired by mid-2018. The repairs will be done in six stages -- five units for each. The Russians have also offered overhaul service for two Mi-35 helicopters, repair and modernisation of five Ka-31 choppers operated by the Indian Navy, as well as offered to India a long-term agreement for repair and maintenance of the Mi-17 helicopters. India is one of the largest operators of Russian-made helicopters. The Mi-17 helicopter fleet of the IAF currently has more than 250 choppers. The Mi-26, the world's largest load-lifting helicopter, is widely used throughout the world for carrying out transport, evacuation, and fire prevention tasks. The Mi-26 is capable of transporting up to 20 tonnes of cargo inside its fuselage or on an external suspension. Russia's Rostec State Corporation was established in 2007 to facilitate development, production and export of high-tech industrial products designed for civilian and military applications. The Corporation comprises over 700 organisations.